Austria′s most famous skiing resorts can be found in the very West of the country and stretch eastwards until the Salzkammergut. The skiing towns of Salzburg usually have a reputation for being appealing for families rather than partying crowds. This seems to change with time: Since Salzburg airport has become a very popular destination for low-cost airlines and charter-flights, the skiing towns like Obertauern attract an increasingly young and hedonistic crowd. If this trend continues, towns like Saalbach-Hinterglemm will soon rival places like Lech, Ischgl and Kitzbühel. In terms of visitors, has already overtaken them: The twin-village in the Pinzgau district in Salzburg ranks among the most visited municipalities in all of Austria. Especially package holidays lure some 1.4 million visitors to Saalbach-Hinterglemm during each winter season - only Vienna and Sölden attract more attention. Easy access from Munich and Salzburg also leads to many day-visitors that enjoy some of Salzburg′s best slopes and mountains, which include the Spielberghorn and the Hochkogel, both just over 2,000 metres high. Saalbach-Hinterglemm became internationally famous in 1991, when it hosted the Skiing World Championship. Speaking of numbers: Saalbach-Hinterglemm has approximately 3,000 residents - enough for being a proper community even off skiing season. Nevertheless, it is ulgy like hell; there is almost nothing left that has an aura of authenticity, since the entire town seems to be more of a skiing theme park than a place where people actually live. The selling points of Saalbach-Hinterglemm are the skiing facilities: 55 lifts grant access to some 200 kilometres of slopes, 10 kilometres of "Loipen" (cross-country skiing slopes), illuminated tobogganing routes and apres-ski bars. Like most major skiing resorts, it offers "cultural" highlights - in the case of Saalbach-Hinterglemm, it is the "Rave on Snow" concert/party and the "Mountain Attack", a hiking and skiing competition. Of the 200 kilometres of slopes, approximately 15 kilometres are black (difficult), 95 kilometres are red (intermediate), 90 kilometres are blue (easy). This means that the area accommodates beginners - which is echoed by the people that are attracted to Saalbach-Hinterglemm: Mostly people form Germany, Britain and the Netherlands. 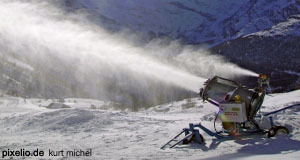 In recent years, Saalbach-Hinterglemm has worked hard on the development of an infrastructure that will ensure the striving on winter tourism independently of global warming and other obstacles: Eight major ponds were built that supply some 470 snow guns with water to generate artificial snow - the biggest armada of its kind in Austria. These facilities are constantly developed and modernised and even work at temperatures above zero. It is arguable whether or not skiing on artificial snow in an otherwise green landscape is very appealing - but technically, it is possible, at least in Saalbach-Hinterglemm. Continue with "Saalbach-Hinterglemm - Part II"